I have to be on a bus to Southampton at 9:30am tomorrow. That means tomorrow’s TFK Long Run in the Bronx isn’t going to work. When I first realized I wasn’t going to be able to do my 13 miles with the team and my running buddy Jackie I wanted to cry. No, really. Everyone has been talking about how great of a route it is and plus I’m going to miss the olympic viewing party after. Even more, Jackie will be out-of-town for the next two weeks – which means 3 weeks we’re on own, just when we decided we’re in this for the long haul together. I had been trying to figure out various options of what time I needed to be out there, what options were available and how far Van Cortlandt Park really is, and I had to finally conclude that it wasn’t happening. 13 miles on my own. I had deja vu of my first half marathon and the same exact lack of enthusiasm. I scrambled for plan B. Hamptons Marathon does group runs with Gubbins on Sunday … I could just move it a day. In fact I recommended it to a fellow TFK’er, Erica, when she said she was going out this weekend. But it’s in East Hampton and I don’t necessarily have access to a car. I could run it with Erica, but she’s slightly faster than me and also in EH. And then in the middle of downward dog and sun salutations I remembered! Summer Streets start this week! Gone was the zen breathing (ok it was never there) and with each move into a pose I was calculated how to make this work. When I got home I looked up the course – 7 miles of Park Avenue closed off. Out and back will get me my 13+ …..perfect! Summer streets is where I really pushed myself in running last year. It’s where I broke PRs (how far I’ve come!) . It’s where I battled the heat and focused on hydration and fueling. It’s where I learned about running on empty …fuel and insulin ….and how that doesn’t work. It’s where I got caught up in the excitement of other runners. By taking it to summer streets I wouldn’t really be running alone, and there’s excitement in the air and water stops along the way. That was instantly settled. But now about time. 13 miles. Right now that’s looking to take me 2h30m – 2h45m. While I plan to sleep and “recover” on the bus (wishful thinking of there being room to stretch my legs …so not going to happen) I want to leave enough time to shower, ice and stretch. Goal is to be back at my apartment by 8:30. That’s not really a goal but more of deadline. Ok so working backwards….that has me heading out at 5am. Blech. Having gone back to a night owl routine that’s rough, but I’d be beating the sun to head up to the Bronx anyways so not much difference. My shins aren’t too happy with me for skipping the compression sleeves lately and all of the hill / street work so I’m a little nervous about a long run on the concrete. I’ve been heating my calves, icing my shins and have grand plans of some serious sticking & foam rolling this evening. Perhaps to episode 2 of Saved by the Bell which I recently discovered on Netflix. 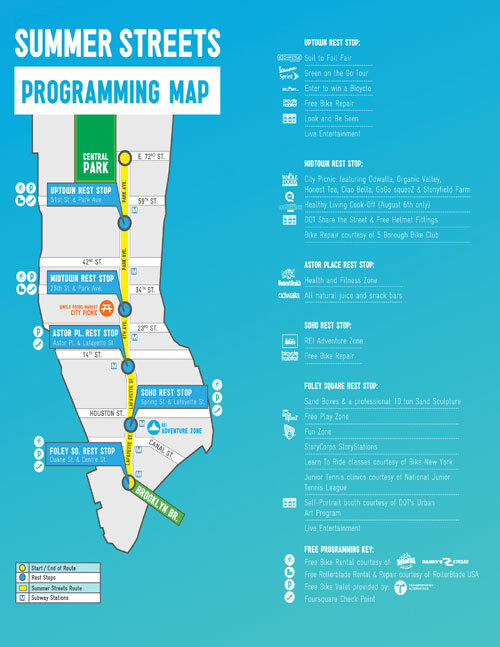 If you’re in NYC have you ran Summer Streets? Are you going tomorrow?? Any suggestions for Netflix entertainment while massaging the heck out of my muscles ? Categories: Running | Tags: Fitting in a run, Hampton Jitney, long run, marathon training, Netflix, nyc, NYC Activities, NYC marathon, running with friends, Solo Run, Southampton, Summer Streets, TFK, Travel, Van Cortlandt Park | Permalink. It was the final day of Summer Streets and after my PDR last week I decided to give it another go. Only this time my (stranger) friend wasn’t there to motivate me and it started out rough. I felt like there were more runners out there this time, compared to all the bikers last weekend. More shirtless guys too might I add. I’ve given up the whole comparison of people passing me thing for the most part and realized that this run wasn’t going to be about speed. But I kept on telling myself to just keep going and if I needed to stop I would but until then just keep trudging along. And I did. For 8+ miles. That’s the longest I’ve run without any breaks or walking yet. I had one moment fighting my phone of incoming work texts but kept it brief and trekked on. I definitely didn’t stretch enough and there was no foam rolling. I know better than that. Gotta work on not coming home and going straight for the shower. Stretching in the shower doesn’t count. But that’s what I did on Saturday, and then walked to a new cafe and got a smoothie and enjoyed a lovely pile of September issues. My new thing when icing (this I am very good about) is to watch silly sitcoms on Netflix & Hulu. Think ABC family. This week it was Switched at Birth. Silly plot lines aside, I found it pretty interesting in how it taught about the Deaf society; I took American Sign Language senior year of high school. Not at all what I thought it was going to be like but I enjoyed it. And still love Ryan Gosling. What’s your shows are you watching these days? Are you more reality TV or sitcom? 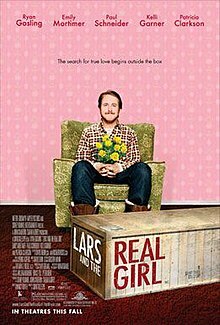 Any recent movies that surprised you? Do you hang out with your co-workers outside of office events? Categories: Life | Tags: bloodsugar, favorite finds, movie, PDR, running, Ryan Gosling, Summer Streets | Permalink. I finally ran Summer Streets! And boy did I run. 10 miles. That would make it the longest distance for me yet. Not only did I PDR it, I also started out pretty strong getting back under the 10m/m. Right from the start I was running along with a girl who would continue to be a pacer for me. It wasn’t a race, it wasn’t a competition, it was just support & motivation …. that she had no idea she was providing. I took a walking break after I hit a 5k mark, I said goodbye in my head to runner girl (no, that’s not creepy. not at all) and slowed down. But after being surrounded by bikers I soon found groups & pairs of runners passing me. As they went past, I realized I wanted to be there with them. Not because I was competitive that they were getting ahead but because I was motivated by them. Running has almost always been a solitary activity for me. I don’t run in Central Park and only part of my route is along the East River. I haven’t tried a running club yet or meet ups and don’t run with friends. There’s been a few times when I’ve fallen in step with someone running the same blocks as me….and I usually don’t like it. But I was reminded on Saturday that being surrounded by other runners is good for me. It pushes me, encourages me …and makes it more fun. I love fitness classes, promotional activities and organized events, so why don’t I mix this in with my running? Perhaps it’s time to look into a running group ? They have ones for people who haven’t fully come back down into the under 10m/m speed right?? 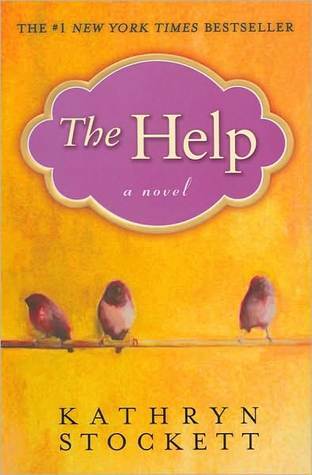 And since I seem to be seeing a lot of movies lately, after anxiously awaiting I saw The Help. I read the book a while back, shortly before they announced they were doing a movie. I loved both! Yes, the movie didn’t include all the points of the book (do they ever) but they didn’t change it either and I thought that they really brought personalities to the characters. I love Emma Stone (as seen by last weeks movie choice…) and was thrilled they made her Skeeter. Do you like running with other people? Have you ran with a running club or team ? Have you seen The Help yet? Did you read the book before hand ? Thoughts on books made into movies …favorites / least favorites? Categories: Life | Tags: Emma Stone, movies, nyc to do, PDR, running, Summer Streets, under 10m/m | Permalink.